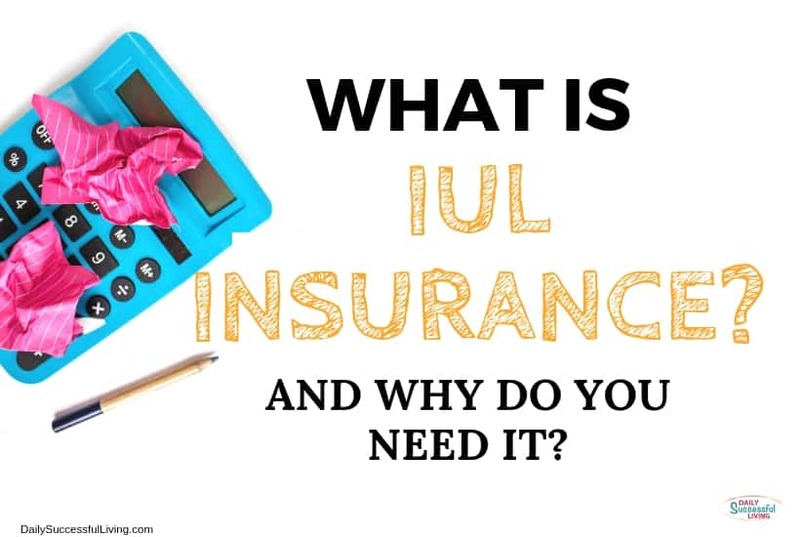 What is IUL Insurance And Why Do You Need It? 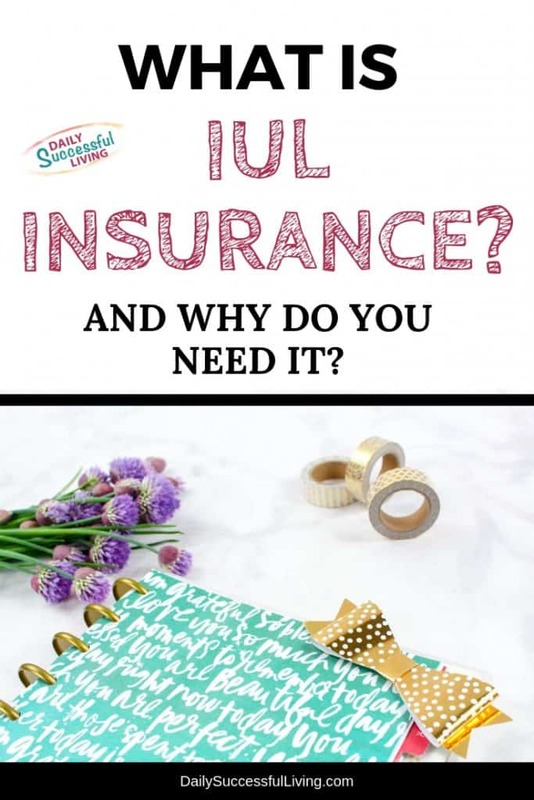 Why Do You Need IUL Insurance? I was always told that the only life insurance I needed was term life insurance. I got my term policy and thought I was good to go. Last year after seeing the abysmal returns of my retirement funds, I went looking for other retirement options. I found index universal life insurance and have completely changed the way I’m planning and contributing for retirement. I’m dumping my 401K since I don’t believe they work for most people. If you are looking for an alternative retirement investment plan then you need to take a look at IUL insurance. Even if you are happy with your IRA or 401K plan you should take a look at IUL investments. IUL stands for index universal life and is a type of life insurance product that has both a death value benefit (think term insurance) and a cash value account that accumulates interest (think investment account – but with asset protection). When structured correctly IUL insurance can be an amazing investment tool. It is a great alternative to 401k’s and IRA’s because of the tax advantages and the cash value account. When combined with the death benefit it can become a great retirement investing tool. Index Universal Life Insurance is a relatively new insurance program that is a combination of term insurance and whole life insurance. It has got some negatives that I’ll talk about below, but overall I feel like it is combining the best features of both types of insurance and can easily blow away your 401k or IRA. What is the death benefit of an IUL Insurance Plan? IUL insurance protects you in the moment by providing a life insurance death benefit. This means that if you die your heirs are entitled to the face value of your policy (as long as you continue to pay the premiums). Death benefits from life insurance policies are a tax-free benefit to your beneficiaries – huge win! The taxable benefits are one of the main reasons that people choose to invest in death benefit policies. What is the Cash Value Benefit of an IUL insurance plan? After purchasing your death benefit and paying administrative fees, the remaining money from your premium begins to accumulate in your cash value account. The best part of this is that the money accumulates with interest. Your money in an insurance IUL is not invested in the stock market. However, your returns on the money are tied to a stock market index (typically the S&P 500). So as the stock market rises and falls, the interest you earn will increase and decrease as well. The absolute best feature of an IUL insurance plan is the cap feature. This cap feature means that you have a high and a low cap in your money. Plans can be written differently, but the vast majority of the plans have a floor of 0% and a max of 11-13%. I’m a huge fan of the 0% floor. I’m all about asset protection and having a floor limits my ability to lose money. 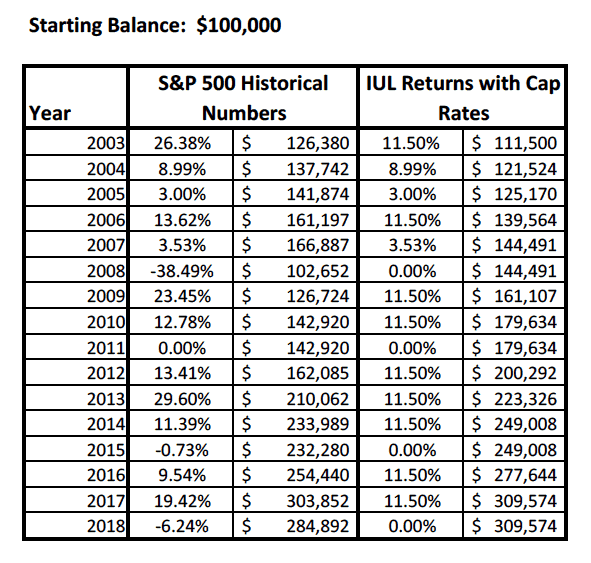 If you had $100,000 in an IUL and the stock market dropped 20%, your IUL cash value would remain at $100,000, in the stock market your value would drop 20% leaving you with a cash value of $80,000. Keep in mind though that the cap also works on the other end, so if the stock market were up 20%, you would cap out at 11.5%. This means that your $100,000 investment would be worth $111,500 rather than the $120,000 you may have gotten in the normal stock market. On the surface, the maximum cap seems like a huge negative (which is it), but I’m very willing to take the max cap in order to get the minimum cap on the other end. Let’s take our example a little bit further and you’ll begin to see why I think that the 0% floor is so valuable. **Assumptions: $100,000 opening balance with no additional contribution. S&P 500 annual numbers were from Macrotrends. I chose a 20-year spread because it included a decent number of negative and positive years with the stock market. As you can see having the 0% floor was worth having the maximum cap of 11.5%. By investing your money in an IUL with a 0% floor you’ll end up making $141,263 more over 20 years. That is a huge difference in return! When I first saw these numbers I couldn’t wrap my brain around. It just seemed so hard to believe that the 0% floor made such a huge impact on the final returns. I got to wondering if a better time frame would yield the same results, so I took out the first four years (1 year of positive and 3 years of negative returns) and the IUL with the minimum and maximize cap still outperformed the S&P 500. Even when I got rid of most of the negative years, the IUL insurance plan still outperformed the S&P 500 by $24,682. Honestly, this is the chart that really helped me see the impact of the 0% floor. If you look at the returns on this spreadsheet, there is really only one horribly negative year (and 2008 was a duzzy! ), but that one year, completely killed everyone’s returns. The problem is that when you have a drop of 40% (I’m lazy and rounding down) you have to earn a return of around 66% to get back to your original number. It can take a long time to get that much of a return. As you can see from the chart it took 4 years after 2008 to get back to the 2007 numbers. 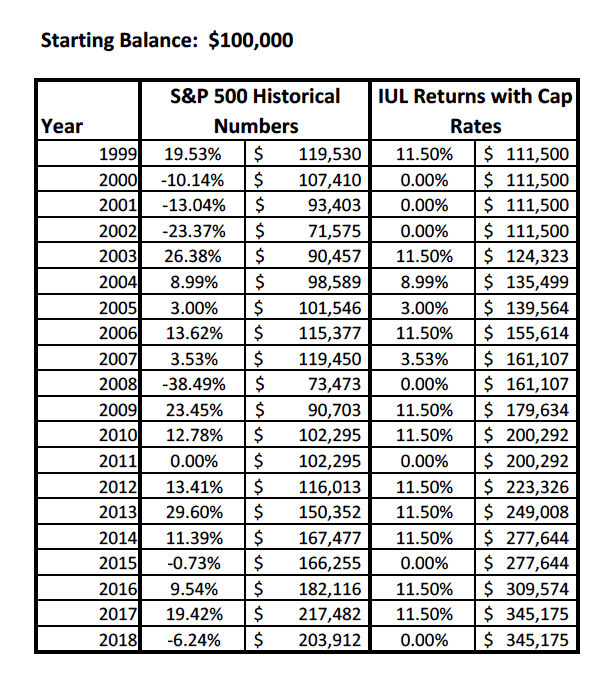 Now go back and look at the first IUL insurance comparison sheet, when you add a few additional bad years in the mix the value of the 0% floor is even more dramatic. I’ve got two disclaimers I want to add. Keep in mind that these are just straight numbers. I’m not facturing in the cost of the actual life insurance or any admin fees. I’m also not accounting for broker fees or index fees with the S&P 500 numbers. Fees can completely kill you when it comes to retirement planning. IUL’s and trading in the stock market have fees! Just because you put in $100,000 doesn’t mean that entire chunk of money is going to go into your cash value account. These are just basic numbers to show you the power of the 0% floor. Another point to consider is that there are broker and people who watch the stock market who probably would have gotten different returns. This comparison assumes that you kept all of your money in the stock market the entire time. Maybe you have an amazing broker who pulled you out and saved you money when the market crashed in 2008. I didn’t have an amazing broker and I was one of the people who lost a lot of money in that crash and then again at the end of 2018. Quite frankly I’m tired of losing money in the stock market – yet another reason I like IUL insurance. Most of us don’t have the luxury of having a top-notch broker managing our money until we’ve been able to accumulate the $500,000 or more needed to get into the really top-notch firms. I certainly don’t have that type of money laying around! It is people like you and me, who can get the most benefit from the 0% floor found in index universal life insurance. If you are tired of the roller coaster of the stock market then you need to check out getting an IUL insurance plan. What IUL Insurance Plan should you choose? It is important to remember that IUL insurance plans can be structured a variety of ways depending on your needs. I personally always recommend what is called a max funded IUL. A max funded IUL means that you are purchasing as little life insurance (death benefit) as possible with your monthly premium. This means that as much of your cash as possible is going into your cash value account. Your goal should be to “max fund” your cash value account as much as possible so that you quickly begin to accumulate interest. The death benefit is a nice extra, but in my opinion what really matters is the cash value of your account. If you read up on index universal life plans you may find some negative reports. However, if you read carefully you’ll notice that they are all using level death benefit plans rather then max funded IUL plans. This means that they are funding their death benefit first rather than focusing on the cash value account. If all of your initial investment is going to pay for your death benefit then you are quickly losing all of the benefits of compounding interest. If you are purchasing an IUL purely for the death benefit, I think you are better off looking at regular term insurance. IUL insurance is a pretty expensive way to purchase life insurance. If you aren’t max funding your cash value account in your index universal life insurance then you are killing your return and spending way, way too much money on your life insurance. I know a lot of people who get around this by purchasing small term insurance policies to cover the gap between what they need and what the IUL insurance covers. Gradually as their IUL insurance death benefit increases, they will reduce their term policies. If an insurance broker is trying to sell you a level IUL insurance plan get out of there quick. I’m just going to be blunt since I’m an insurance agent. You get higher commissions on level IUL insurance which is why some agents push the product more. I won’t get anywhere near as much commission on a max funded IUL insurance policy, but in my opinion, they are significantly better for the clients. Should you purchase an Index Universal Life Insurance plan? I am a huge fan of IUL insurance plan and personally, I believe if they are structured correctly they can make you a whole lot of money. The 0% floor is an amazing feature that protects your assets. I work really hard for my money and I want to know that my assets are protected. Can you lose money – yes! If the stock market crashes for multiple years in a row, then ultimately you are probably in trouble because at that point everything is failing. I don’t think there is anything that will protect you except gold and bullets at that point. However, as long as we continue to have the same level of historic returns then an IUL insurance plan is a great way to start planning for your retirement. I’d love to help you get started, I love watching the excitment in people’s eyes when they realize that they can actually retire. If you are concerned about having enough money for retirement this is your answer. At least take a little bit of time and let me run some numbers for you. I think (actually know) you’ll be pleasantly surprised. I’m not licensed in all states, but can direct you to a broker I trust if I can’t help you personally. Feel free to call me at 475-619-2740 or contact me via email or through any of my social media platforms (links are on the right). I’d love to hear from you!